They aren't going to win any beauty contests, at least not at first glance. Gadwalls don't have a shimmering green head that lights up in the afternoon sky, no clownish bill, nothing but a mottling of gray and white feathers. Maybe that's why a gadwall has graced the federal duck stamp just once in 79 years. But what they lack in flamboyance, gadwalls make up for in resilience. Once just another bird to fill out a limit of mallards, gaddies have turned into one of the most abundant and prolific birds on the continent. According to the 2012 U.S. Fish and Wildlife Service waterfowl breeding population survey, there were 3.6 million gadwalls spread out over the country, outnumbered only by mallards, blue-winged teal, scaup and shovelers. They weren't always so abundant. For years, gadwall numbers hovered around 1.5 million, bouncing a little above and below that average throughout the 1960s, '70s and '80s. Then, sometime in the mid-90s, their numbers not only jumped, they went through the roof, increasing to about 4 million in 1996. Other species also rode the spike in abundant water and prime nesting conditions, but gadwall populations jumped even more. Their numbers fell a few years later on the heels of poor nesting conditions in the Prairie Pothole Region, but thanks to several good hatches since, gadwalls are once again one of the most abundant duck species in North America and a major component of the fall flight in the Mississippi Flyway. Their tenaciousness is due to a number of factors, but biologists agree it's largely a result of their nesting habits. 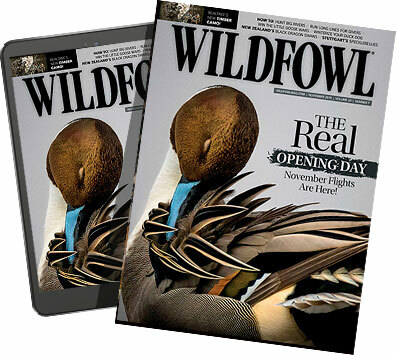 Of all the duck species, only gadwalls, shovelers and blue-winged teal wait a month or so after arriving on the nesting grounds to start hollowing out a depression and building a nest. USFWS biologist David Brandt says that characteristic gives hens an upper hand for a number of reasons. First, predators are feasting on ducklings of other species and less likely to prey on adult gadwalls. Gadwall ducklings tend to hatch in a much shorter window, as well, usually within a week to 10 days. No matter how many baby gadwalls predators eat, plenty survive to adulthood. It's one reason they have a somewhat higher survival rate than mallards, which produce ducklings over a longer period during the breeding season. Brandt studied duckling survival by fixing newly-hatched gadwalls and mallards with tiny radio transmitters that allowed him to examine survival rates of the two species. Although there wasn't a tremendous difference, gadwall ducklings had a three to five percent higher survival rate than mallards. Over time, however, that additional recruitment can have a positive impact on the total population, especially when times are tough. Brandt and other researchers believe late nesting offers a major advantage for another, more important reason: The available nesting cover is taller and denser, thereby offering more protection to sitting hens and their nests. Dr. Robert Blohm, the former chief of the Office of Migratory Bird Management, studied gadwalls in southern Manitoba from 1972-1975. He often found them in the densest cover available, so thick he sometimes had trouble locating sitting hens. Some nests were in a thicket of shrubs; others were tucked under a dense canopy of stinging nettles. Delayed nesting does have at least one disadvantage, says Brandt. "Mallards and others can rely on fat reserves they built up over the winter and on their way back north if they have to. They can pop out a nest when they arrive even if conditions are bad," he explains. "Gadwalls are dependent on adequate food on the nesting grounds. If it isn't there, they are in trouble because they go into their breeding season in poor shape." That certainly hasn't been the case, at least not recently. Gadwalls are booming, and it isn't just because they nest later than other species. Blohm says they have a strong preference for nesting on islands, offering protection from terrestrial predators unwilling to swim for a meal. During his research, Blohm found high concentrations of the birds on small and large islands, but very few other duck species. He's not sure why gadwalls were so abundant on islands while other ducks were rare, but it was a common occurrence. "They also tend to nest in colonies," adds Blohm. "I once found four nests in a single square meter, and smaller islands were generously scattered with gadwall nests. That high nest density also produced a lot of baby ducks in a very small area all at once, which makes it hard for local predators to eat them all before they grow large enough to avoid predation." It's a good thing gadwalls have evolved into specialized, prolific breeders. Hunters kill an awful lot of them each season. In 2011, hunters harvested 2.3 million, more than half of their entire population. Louisiana hunters take the most by far — 840,000 in 2011 — followed by Arkansas, where hunters killed about 260,000 the same year. Mississippi hunters bagged about 80,000, including 900 taken by Mike Boyd's clients. A guide on Mississippi's fabled Beaver Dam Lake and a lifelong hunter, Boyd, 52, figures about 60 percent of his annual take consists of gadwalls. His palatial blinds are located in holes within cypress trees, where, when things go right, gadwalls and mallards teeter through the Spanish moss-draped limbs as they fall into the decoys. "You can reason with a mallard," says Boyd, "but you can't reason with a gadwall. They are like no other duck. They do what they want to, not what you want them to." That unpredictability is exactly why he loves them. "It's almost a guessing game. Just when you think you've got them figured out, they make a fool out of you," adds Boyd. Despite their fickle nature, Boyd has learned a few things in his 40 years of chasing gadwalls and other ducks. The most important lesson centers on that unpredictability: When the opportunity for a shot presents itself, take it. Unlike a flock of mallards, which can be often coaxed to the water with some artistic calling, skittish gadwalls won't often make a second or third pass as they swing over a spread. When they wing into range, you'd better shoot. If they swing behind you one more time, says Boyd, there's a good chance you'll never see them again. "Some days they can be ornery and spooky; other times they'll drop right into the decoys like they were on a string," he notes. "You just never know, which is why I prefer to take my shots as soon as I have the chance instead of waiting for them to set their wings right over the decoys." Go-Devil Boats owner Warren Coco agrees. A lifelong Louisiana resident, he's coined a term for gaddies: "wide-lighting gray ducks," a name that refers to their tendency to settle on the water far out of range. "They'll sit out in open water two or three hundred yards away and just look at you," he says. The good news is they don't require any special calls or fancy decoy tricks. Sometimes, they'll surprise you in a good way. Coco has watched flocks of gadwalls lock up their wings and fall into the decoys from dizzying heights. "They are so high sometimes, they look just like little specks, but they'll never move their wings once as they come down," adds Coco. He and Boyd use a standard hen mallard call, blowing it much the same as he would for any other puddle duck species. Boyd also mixes mallard decoys into his spread, with about a 60/40 ratio of gadwalls to mallards. As the season draws to a close, he will cut the number of birds in his spread in half. But even that doesn't guarantee the birds will settle into his decoys. Despite their unpredictable nature, both veteran hunters have a soft spot for gadwalls. Boyd even sees beauty in them when so many other hunters just see a drab gray bird. "When you hold one in your hand and look at them close, they have quite a bit of color to them," says Boyd. Maybe next year an artist will capture that subtle beauty and a gadwall will once again grace the federal duck stamp, giving them the respect they often don't get, but surely deserve.